↑ "Encyclopedia". Archived from the original on August 3, 2007. Glossary of Library Terms. Riverside City College, Digital Library/Learning Resource Center. Retrieved on: November 17, 2007. ↑ 2.0 2.1 Hartmann, R. R. K.; James, Gregory; James, Gregory (1998). Dictionary of Lexicography. Routledge. p. 48. ISBN 0-415-14143-5. สืบค้นเมื่อ July 27, 2010. ↑ "Encyclopaedia". Encyclopædia Britannica. สืบค้นเมื่อ July 27, 2010. An English lexicographer, H.W. Fowler, wrote in the preface to the first edition (1911) of The Concise Oxford Dictionary of Current English language that a dictionary is concerned with the uses of words and phrases and with giving information about the things for which they stand only so far as current use of the words depends upon knowledge of those things. The emphasis in an encyclopedia is much more on the nature of the things for which the words and phrases stand. ↑ Hartmann, R. R. K.; Gregory, James (1998). Dictionary of Lexicography. Routledge. p. 49. ISBN 0-415-14143-5. สืบค้นเมื่อ July 27, 2010. In contrast with linguistic information, encyclopedia material is more concerned with the description of objective realities than the words or phrases that refer to them. In practice, however, there is no hard and fast boundary between factual and lexical knowledge. ↑ Cowie, Anthony Paul (2009). The Oxford History of English Lexicography, Volume I. Oxford University Press. p. 22. ISBN 0-415-14143-5. สืบค้นเมื่อ August 17, 2010. An 'encyclopedia' (encyclopaedia) usually gives more information than a dictionary; it explains not only the words but also the things and concepts referred to by the words. ↑ "Encyclopedias and Dictionaries". Encyclopædia Britannica (15th edition) 18. (2007). 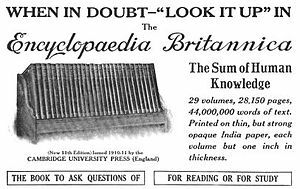 Encyclopædia Britannica, Inc.. 257–286. หน้านี้แก้ไขล่าสุดเมื่อวันที่ 12 มีนาคม 2562 เวลา 14:11 น.